Figure 9.22: Detection and identification of lumen. 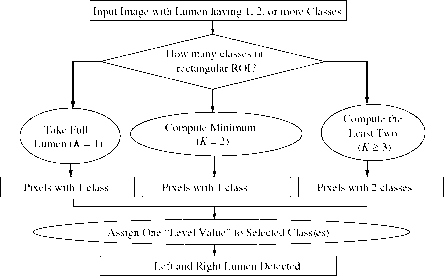 Input image is a classified image with multiple classes inside the lumens. Given the number of classes K and the region of interest (ROI) of each region, the appropriate classes are merged and the image is binarized. 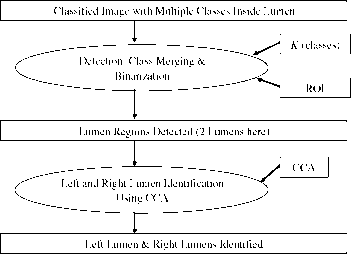 The detected lumens are then identified using connected component analysis (CCA), and the left lumen and right lumen are identified. due to the bifurcations in the arteries of the plaqued vessels (see sections 9.6.1 and 9.6.2). Figure 9.23 illustrates the region merging algorithm. The input image has lumens which have one, two, or more classes. If the number of classes in the ROI is one class, then that class is selected; if two classes are in the ROI, then the minimum class is selected; and if there are three or more classes in the ROI, then the minimum two classes are selected. The selected classes are merged by assigning all the pixels of the selected classes one level value. This process results in the binarization of the left and right lumens. The binary region labeling process is shown in Fig. 9.24. The process uses the CCA approach of top to bottom and left to right. 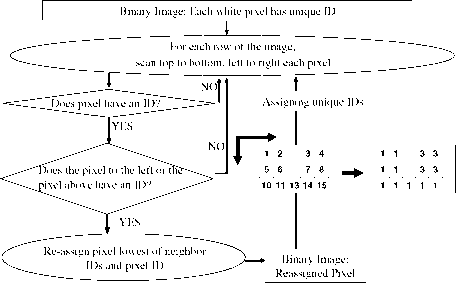 Input is an image in which the lumen regions are binarized. The CCA first labels the image from the top to the bottom, and then from the left to the right. The result is an image that is labeled from the left to the right. Figure 9.23: Region detection: region merging algorithm. The input image has lumens that have 1, 2, or more classes. If the number of classes in the ROI is one class, then that class is selected; if two classes are in the ROI, then the minimum class is selected; and if there are three or more classes in the ROI, then the minimum two classes are selected. The selected classes are merged by assigning all the pixels of the selected classes one level value. This process results in the left and right lumen being binarized. Figure 9.24: Region identification using connected component analysis (CCA). 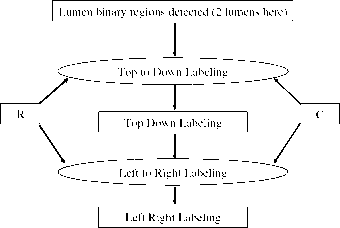 Input is an image in which the lumen binary regions are detected. The CCA first labels the image from the top to the bottom, and then from the left to the right. 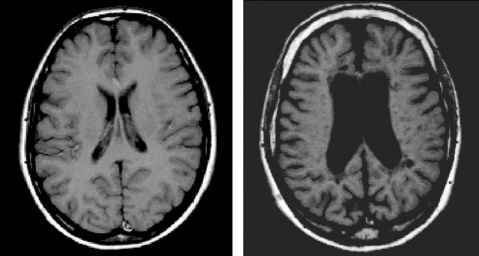 The result is an image that is labeled from the left to the right. Figure 9.25: Region identification: ID assignment. In the connected component analysis (CCA), in the input binary image each white pixel is assigned a unique ID. Then the label propagation process results in connected components. Figure 9.26: Region identification: propagation. This is the first pass of the label propagation process. Given the bianary image having unique IDs for each white pixel, every row of the image is scanned from top to bottom, left to right, pixel by pixel. If the pixel has an ID, then pixels to the left and above of the pixel are checked for IDs, and if either one has an ID, then the pixel's value is reassigned to that of the lowest among the neigbor pixels and the pixel. This processed is repeated for all pixels in the row all rows. The result is a binary image with reassigned pixel values. Figure 9.27: Region identification: propagation. This is the second pass of the label propagation process. 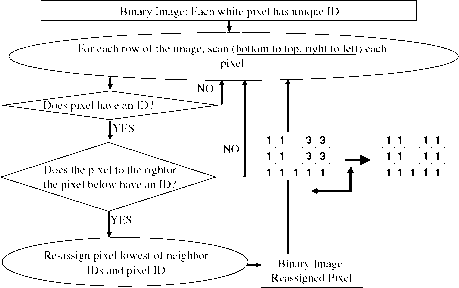 Given the binary image having unique IDs for each white pixel, every row of the image is scanned from bottom to top, right to left, pixel by pixel. If the pixel has an ID, then pixels to the right and below of the pixel are checked for IDs, and if either one has an ID, then the pixel's value is reassigned to that of the lowest among the neigbor pixels and the pixel. This processed is repeated for all pixels in the row and all rows. The result is a binary image with reassigned pixel values. in green estimated boundary image. These three images are fused to produce a color overlay image.